At the very time when Lithuania was thus becoming a compact, united, powerful state, Poland seemed literally to be dropping to pieces. Not even the exhortations of the popes could make her score of princes unite for mutual defence against the barbarians who environed them. For a time it seemed highly probable that Poland would be completely germanized, like Silesia, or become a part of the new Bohemian Empire which Wenceslaus I. 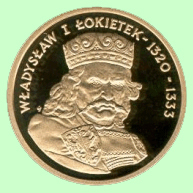 (crowned king of Poland in 1300) had inherited from his father, Ottakar II. From this fate she was saved by the valour of Wladislaus Lokietek, duke of Great Poland (1306-1333) who reunited Great and Little Poland, revived the royal dignity in 1320, and saved the kingdom from annihilation by his great victory over the Teutonic Knights at Plowce in 1332. The whole reign of Wladislaus 1. was indeed an unceasing struggle against all the forces of anarchy and disintegration; but the fruits of his labours were richly reaped by his son Casimir III. the Great (1333-1370), Poland's first great statesman in the modern sense of the word, who, by a most skilful system of matrimonial alliances, reintroduced isolated Poland into the European system, and gave the exhausted country an inestimably beneficial breathing space of thirty-seven years. A born ruler, Casimir introduced a whole series of administrative and economical reforms. He was the especial protector of the cities and the peasants, and, though averse from violent measures, punished aristocratic tyranny with an iron hand. Casimir's few wars were waged entirely for profit, not glory. It is to him that Poland owed the important acquisition of the greater part of Red Russia or Galicia, which enabled her to secure her fair share of the northern and eastern trade. 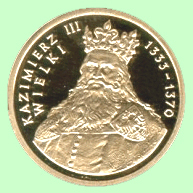 In default of male issue, Casimir left the Polish throne to his nephew, Louis of Hungary, who ruled the country (1370-1382) through his mother, Queen Elizabeth, Wladislaus Lokietek's daughter. Louis well deserved the epithet of "great" bestowed upon him by his contemporaries; but Poland formed but a small portion of his vast domains, and Poland's interests were subordinated to the larger demands of an imperial policy which embraced half Europe within its orbit. On the death of Louis there ensued an interregnum of two years marked by fierce civil wars. instigated by Duke Ziemovit of Masovia, the northernmost province of Poland, which continued to exist as an independent principality alongside of the kingdom of Poland. Ziemovit aimed at the Polish crown, proposing to marry the infant princess Jadwiga of Hungary, who, as the daughter of Louis the Great and the grand-daughter of Wladislaus Lokietek, had an equal right, by inheritance, to the thrones of Hungary and Poland. 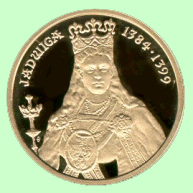 By an agreement with the queen-mother of Hungary at Kassa in 1383, the Poles finally accepted Jadwiga as their queen, and, on the 18th of February 1386, greatly against her will, the young princess, already betrothed to William of Austria, was wedded to Jagiello, grand duke of Lihtuatania, who had been crowned king of Poland at Cracow three days previously, under the title of Wladislaus II. The union of Poland and Lithuania as separate states under one king had been brought about by their common fear of the Teutonic Order. Five years after the death of Gedymin Olgierd, the most capable of his seven sons, had been placed upon the throne of Lithuania by his devoted brother Kiejstut, and for the next two-and-thirty years (1345-1377) the two princes still further extended the sway of Lithuania, principally at the expense of Muscovy and the Tatars. Kiejstut ruled the western portion of the land where the Teutonic nigh s were a constant menace, while Olgierd drove the Tatar hordes out of the southeastern steppes, and compelled them to seek a refuge in the Crimea. During Olgierd's reign the southern boundaries of Lithuania touched the Black Sea, including the whole tract of land between the mouth of the Bug and the mouth of the Dnieper. 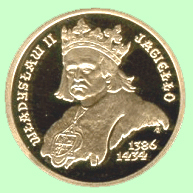 Olgierd was succeeded by his son Jagiello as grand duke in 1377, while Kiejstut was left in possession of Samogitia, Troki and Grodno; but the Teutonic Order, alarmed at the growth of Lithuania, succeeded in estranging uncle and nephew, and Kiejstut was treacherously assassinated by Jagiello's orders, at Krewo, on the 15th of August 1382. Three weeks later Jagiello was compelled to cede Samogitia, as far as the Dubissa, to the Knights, and in the following year they set up against him Kiejstut's son Witowt. The eyes of Jagiello were now opened to the fact that the machiavellian policy of the Knights aimed at subjugating Lithuania by dividing it. He at once made peace with his cousin; restored him his patrimony; and, to secure Lithuania against the future vengeance of the Knights, Jagiello made overtures to Poland for the hand of Jadwiga, and received the Polish crown along with it, as already mentioned. The paucity and taciturnity of our sources make it impossible to give anything like an adequate picture of Old Poland during the first four centuries of its existence. A glimpse here and there of the political development of the country is the utmost that the most diligent scrutiny can glean from the scanty record of the early chronicles. External pressure, here as elsewhere, created a patriotic military caste, and the subsequent partitional period, when every little prince had his own separate court, still further established the growing influence of the szlachta, or gentry, who were not backward in claiming and obtaining special privileges in return for their services. The first authentic pacta conventa made between the Polish nobility and the Crown dates from the compact of Kassa (September 17, 1374), when Louis of Hungary agreed to exempt the szlachta from all taxation, except two Polish groschen per hide of land, and to compensate them for the expenses of all military service rendered beyond the confines of the realm. The clergy received their chief privileges much earlier. It was at the synod of Leczyca, nearly a century before the compact of Kassa, that the property of the Church was first safeguarded against the encroachments of the state. The beneficial influence of the Church of Poland in these early times was incalculable. To say nothing of the labours of the Cistercians as colonists, pioneers and church-builders, or of the missions of the Dominicans and Franciscans (the former of whom were introduced into Poland by Ivo, bishop of Cracow,1 the personal friend of Dominic), the Church was the one stable and unifying clement in an age of centrifugal particularism. The frequent synods represented the whole of Poland, and kept alive, as nothing else could, the idea of national solidarity. The Holy See had also a considerable share in promoting the political development of the land. In the 13th century alone no fewer than forty-nine papal legates visited Poland, and thirty provincial synods were held by them to regulate church affairs and promote good government. Moreover the clergy, to their eternal honour, consistently protected the lower from the tyranny of the upper classes. The growth of the towns was slower. During the heroic Boleslawic period there had been a premature outcrop of civil life. As early as the 11th century Kruschwitz, the old Polish capital, and Gnesen, the metropolitan see, were of considerable importance, and played a leading part in public life. But in the ensuing anarchic period both cities were utterly ruined, and the centre of political gravity was transferred from Great Poland to Little Poland, where Cracow, singularly favoured by her position, soon became the capital of the monarchy, and one of the wealthiest cities in Europe. At the end of the 14th century we find all the great trade gilds established there, and the cloth manufactured at Cracow was eagerly sought after, from Prague to Great Novgorod. So wealthy did Cracow become at last that Casimir the Great felt it necessary to restrain the luxury of her citizens by sumptuary ordinances. Towards the end of the 14th century the Polish towns even attained some degree of political influence, and their delegates sat with the nobles and clergy in the king's councils, a right formally conceded to them at Radom in March 1384. Even the peasants, who had suffered severely from the wholesale establishment of prisoners of war as serfs on the estates of the nobles, still preserved the rights of personal liberty and free transit from place to place, whence their name of lazigi. The only portion of the community which had no privileges were the Jews, first introduced into Poland by Boleslaus the Pious, duke of Great Poland, in 1264, when bitter persecutions had driven them northwards from the shores of the Adriatic. Casimir the Great extended their liberty of domicile over the whole kingdom (1334). From the first they were better treated in Poland than elsewhere, though frequently exposed to outbreaks of popular fanaticism.